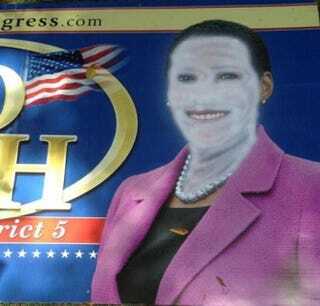 Campaign signs are often vulnerable to being stolen or tampered with, especially in this political environment, but in what might be a first, a black Florida Republican congressional candidate had one of her signs destroyed by whiteface, the National Review Online reports. Glo Smith, who is hoping to become the Republican candidate for Florida’s 5th Congressional District election in November, tweeted a picture of the sign yesterday, quipping, “This is sad, but I’m all for diversity.” The district is currently represented by Democratic Rep. Corrine Brown. The primary will take place in August. Smith, who told the National Review that she’s had signs stolen before, reportedly learned about this particular defacement last Tuesday. On the sign, which was on private property in Jacksonville and could be seen from Interstate 10, Smith’s face had been painted white, although the offender had carefully avoided her eyes and mouth. “We expect signs to be tampered with or stolen,” Smith told the website, “but not to this extent.” So far she has not reported the incident to the police. Read more at the National Review Online.